No need to compromise safety for style, these dress-casual work shoes offer toe protection and a design appropriate for most professional work environments. Choose from lace-up and slip-on styles. Most styles fit below the ankle, offering maximum flexibility at the ankle. Safeguard the tops of the feet against injury with shoes that have integral metatarsal guards. 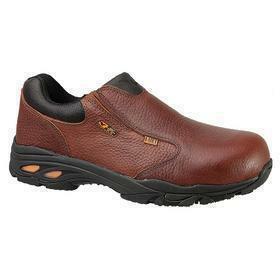 These dress casual style shoes have a safety toe and a guard that overlaps the edge of the toe cap and extends over the metatarsal bone area to help protect against impact from falling objects. They meet ASTM F2413-11 section 5.3 specifications for metatarsal protective (Mt) footwear. Internal guards are built into the inside of the shoe. External guards are attached to the outside of the shoe.